It’s Wednesday, meaning it’s time to take a look at what I eat in a typical day! In no way do I eat perfectly (I mean, who does really?) but I’m hoping these posts show you how easy and versatile vegan food is. At the start of my vegan journey I really enjoyed seeing what fellow vegans ate to gain inspiration for future meals. I hope this helps! 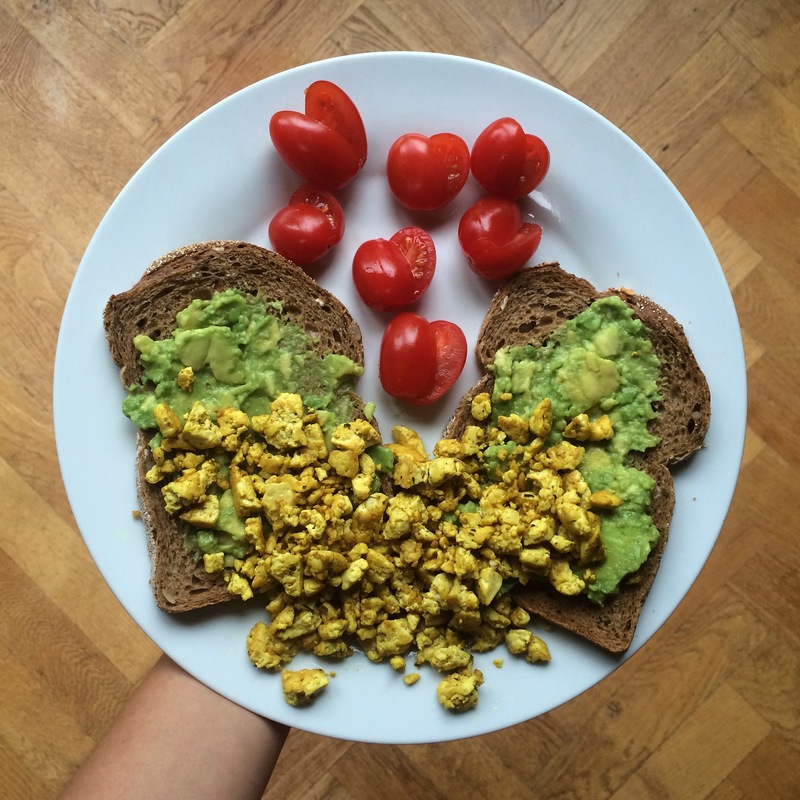 I have a new favourite breakfast and it’s tofu scramble. For a long time I stayed away from tofu because the few times I tried to cook with it, I failed miserably. I’ve since realised that the trick is to drain your tofu of liquid; it makes it so much easier to work with! I loosely followed Minimalist Baker’s recipe, and seasoned my tofu with garlic and curry powder. Eaten on avocado toast, this breakfast is simply amazing. I can’t help craving something sweet to accompany my morning coffee and this snack satisfies my craving expertly. 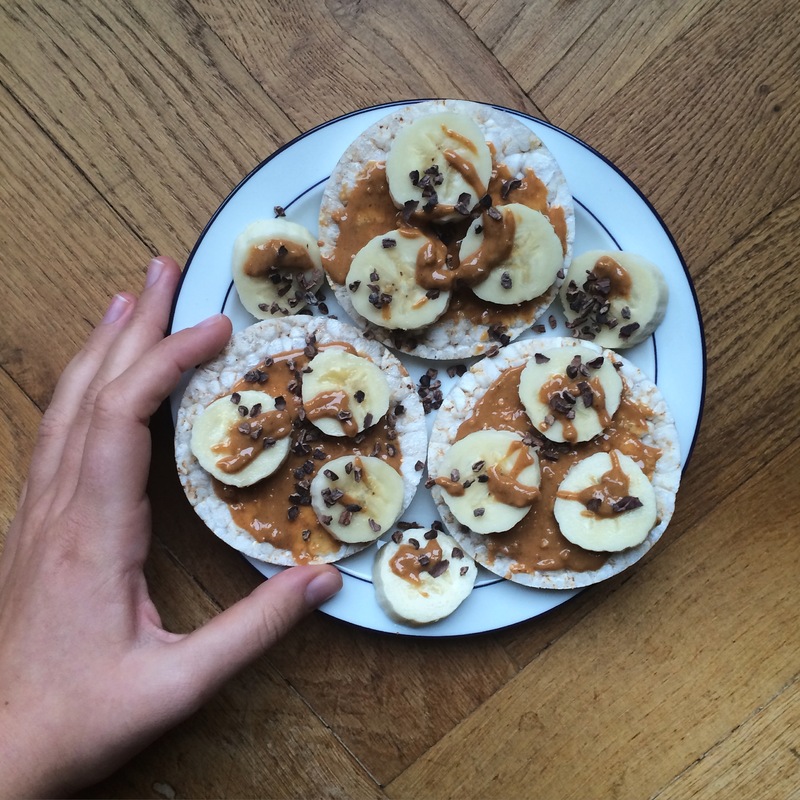 Take some rice crackers, spread them with peanut butter and top with banana and cacao nibs. 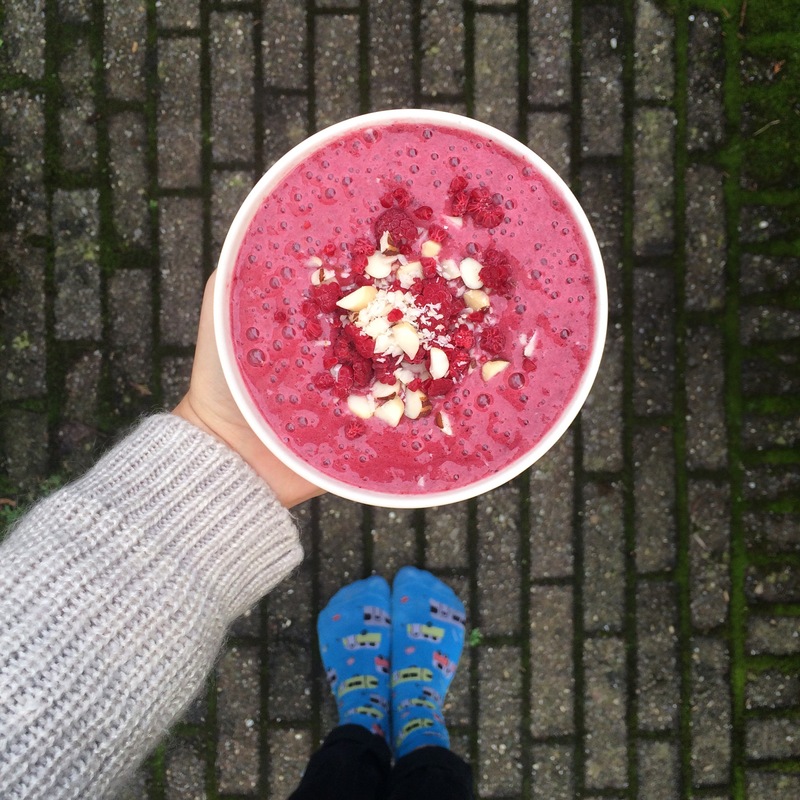 Delicious and nutritious; what more do you want? My lunch was a typical “I have a bunch of random food in my fridge that needs to be used up NOW” meal. 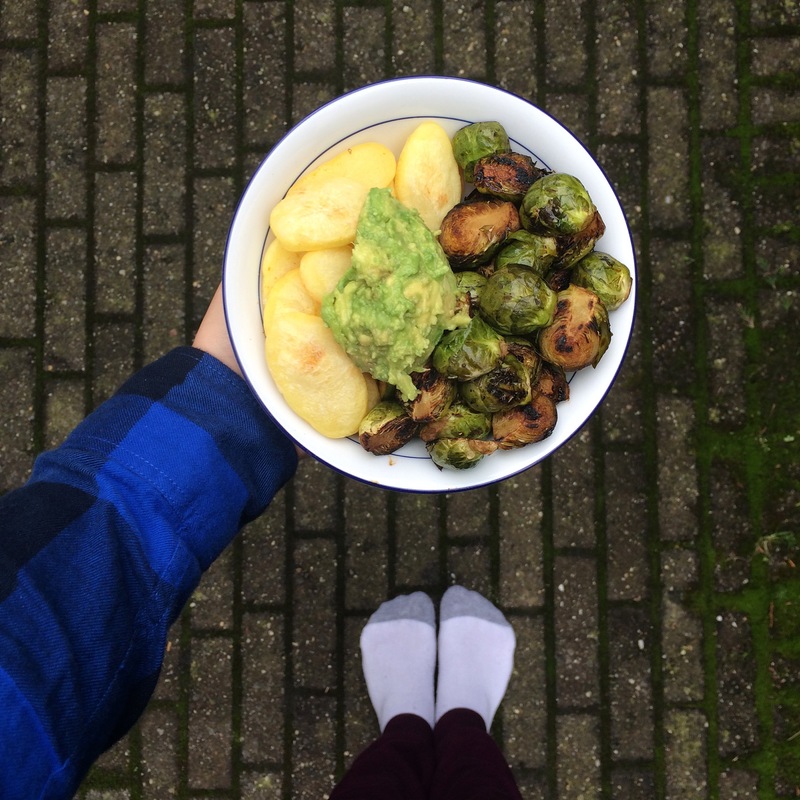 I roasted some potatoes and brussel sprouts in the oven and topped it with mashed avocado. It’s a simple meal but that’s exactly what I crave sometimes. My blender and I have been best buddies recently; we’ve been spending plenty of quality time together. For my afternoon snack I blended together two bananas, a mango and a bunch of frozen raspberries. The result is a delicious fruit snack with the most beautiful colour. Can you tell I really love brussel sprouts? 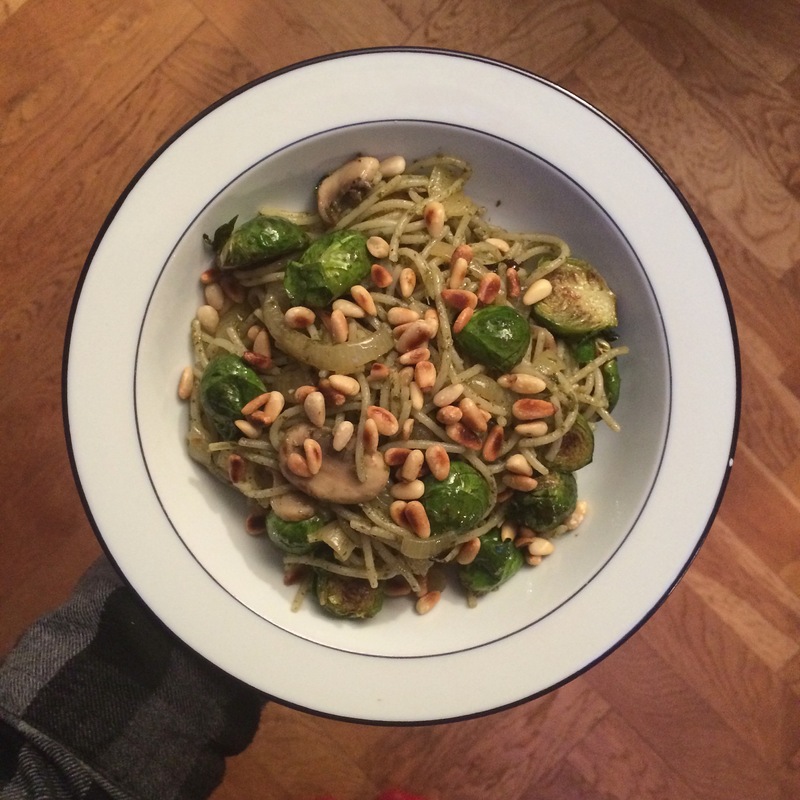 This time I worked them into a green pesto pasta with mushrooms and topped with roasted pine nuts. I can guarantee you I had seconds (and maybe even thirds…) of this meal!